Listomni Lists from Ontomni aims to help you run your life from lists on your iPhone or iPod touch. The $7 app is almost comically feature-laden, allowing you to track everything from your to-do list to your grocery list to your budgets, and beyond. Ontomni clearly worked to make data-entry and recall painless with Listomni, and mostly succeeded. Though the app sometimes tries harder than it needs to, I’m impressed with its depth. Better Living Through Lists: There’s a bit of a learning curve with Listomni Lists, but if you spend some time with the voluminous help features, you’ll enjoy the app’s efficient list management. Listomni goes out of its way to help acclimate you to the app. There’s voluminous help available within the app, and it covers pretty much every everything. Since Listomni’s take on lists and list-management is occasionally unconventional, this help text is a good thing. Spend some time with it. When you first launch Listomni, you’ll note that the app comes pre-loaded with tons of sample data. I could find no obvious way to clear it out, which is frustrating. But once you start entering your own data into Listomni, you’ll immediately appreciate the care that the developers put into text entry: As you enter in a new item for your Groceries list, the app starts auto-predicting from its built in dictionary; by the time I tapped out “salti,” it knew I meant Saltines. 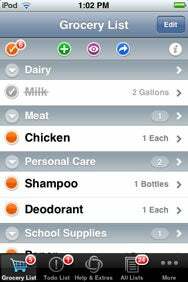 Your completed Grocery list is automatically grouped by category (“Dairy,” “School Supplies,” and so on), which makes aisle navigation a breeze. Adding items to other list types, like to-do entires or books, is similarly straightforward. Each entry can contain as many or as few details as you’d like. You can check off completed items, or swipe to delete them. I wish there were a way to permanently hide fields I don’t need (“pre-tax price”), but that’s a small complaint. Listomni lets you reorganize everything. You can reorder your different lists, reorder the items within them, and even choose which options are visible on the tab bar. You can create your own custom lists as well—I use one to track books I’ve lent to friends, and another to keep track of my Macworld assignments. Listomni is powerful and full-featured. If you need a list to keep track of your lists, this app deserves a spot on your iPhone. Listomni Lists is compatible with any iPhone or iPod touch running the iPhone 2.x software update.